This restaurant located very closet o the Pontific University of Salamanca offers a great variety of homemade dishes on their menu at a very good price. The food is quality and the service is friendly. In summary: Patio Chico is a cozy place. There is plenty of meat to be found in this region of Spain and it must be washed down with a nice wine (Ribera de Duero perhaps???). The pepper streak or the Castillas soup (which is great in the winter) accompanied with a glass of Ribera wine and desert is what I had. But there is much more to choose from on the menu (not much fish though). Also called “El Patio Chico,” this restaurant is located in the heart of Salamanca. 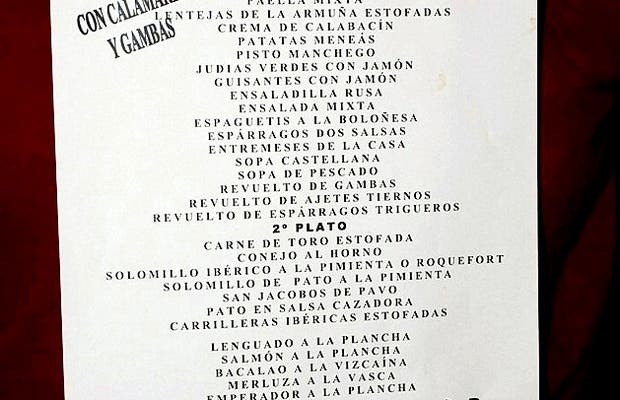 We discovered it by chance and I have to rank it up with the best gastronomic choices in Salamanca. We soon realized what a great place we had found when the bar and tables soon filled up shortly after we entered. Like in the rest of Castilla, each drink you order comes with a tapa (small appetizer-sized dish), but what great tapas! They ranged from ribs, to ensaladilla rusa (Russian potato salad), muscles, meatballs, grilled chorizo, port belly, etc. If the tapas sound good, just wait until you come and try the actual menu. Although they have a small grill, the dishes are really good. Great sausages, and great grilled meats.